However, GREASY cardboard does not go in recycling. So where does it go? It could go into Trash or Compostables, but the direction is not clear. Normally, cardboard doesn’t go into compost, and the Seattle Trash bins are so small, it is difficult squeeze a pizza box into it. So it is easy to see how our intrepid dog sitters dithered on this decision. Leave it to Mongo to come up with a solution. 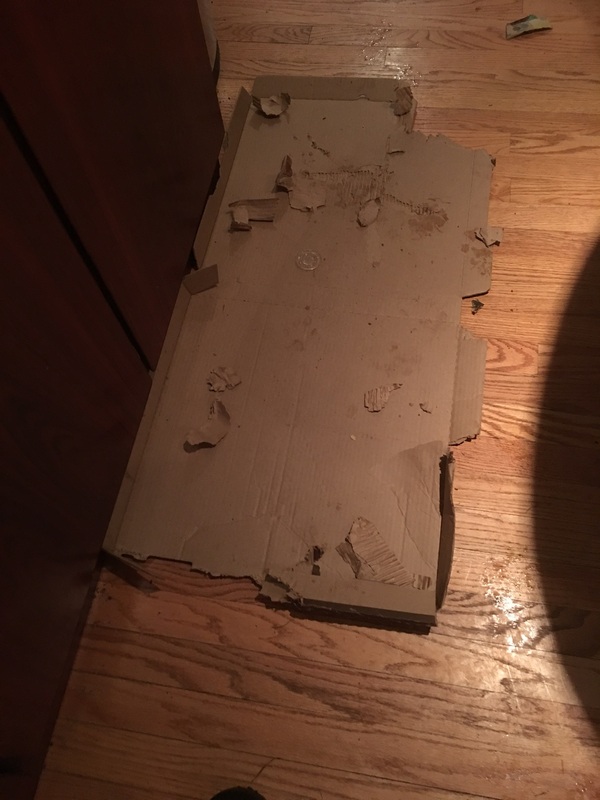 By eating every last bit of grease soaked cellulose and cheese covered cardboard from the subject pizza box overnight, the box could simply be put directly into Recycling the next morning! LOL, egg boxes, egg shells. Mongo eats whatever it takes. Um…..wow. I am always amazed by Mongo’s solutions to various disposal problems.